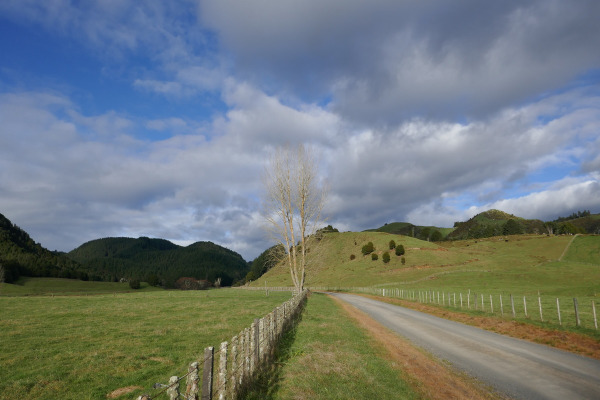 This two to three days adventure on the south-eastern border of the King country is a good weekend get-out or if you are cycling through NZ it’s a welcome change from the roads and car traffic. Plus it is on the easy side as it’s mostly downhill... once you’ve passed the initial climb. 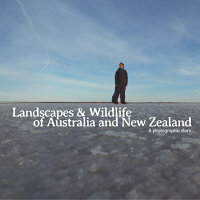 By car: Ongarue is 263 km or 3 hours 30 minutes drive from Auckland. Pureroa is 253 km and 3 hours 20 minutes. By bike: the trail end at Ongarue is accessible via quiet backcountry roads. Pureroa is on the busier SH30 but it still is not too bad. From the east you can join the Waikato River Trail, another cycle trail, at Mangakino. To the west you can get on the Forgotten World Highway, another worthwhile (but hilly!) ride towards Strathford and the Taranaki volcano. Public transport: sadly, if there is a train going through Ongarue, the Northern Explorer, on the Auckland-Wellington railway has never stopped there and it is not stopping in Te Kuiti or Taumarunui, the two nearest railway stations, anymore since 2012. This shows the sad state of public transport in New Zealand, and the heavy reliance on private cars to go anywhere. 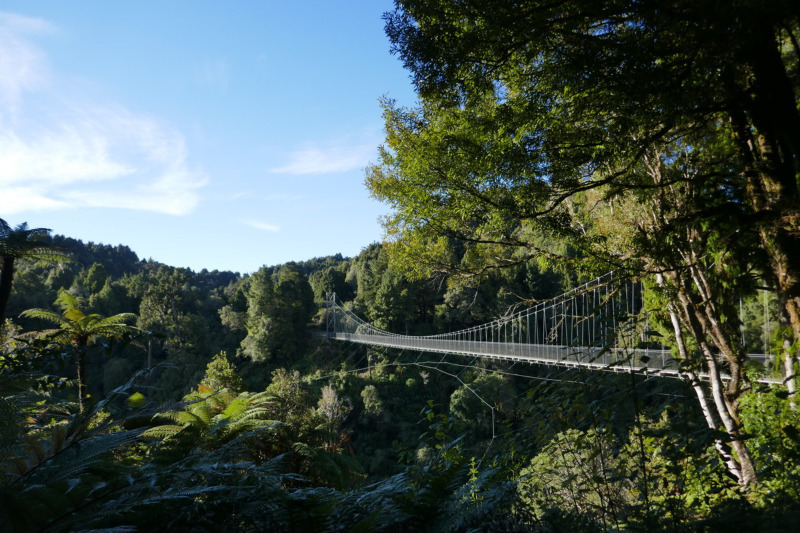 The last options are to stop in Otorohanga (75 km from the start of the trail in Pureroa), or in National Park (67 km from the end in Ongarue). The Northern Explorer travels 3 times a week, and the fare is usually $60-$100 for a Auckland to Otorohanga one way ticket. Best direction: north to south (Pureroa to Ongarue), as it is mostly downhill! Best season: any. 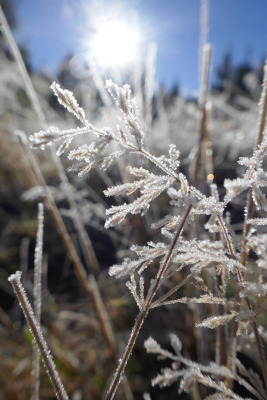 Will be cold in winter though, so pack warm clothes. The highest point of the trail, near the Purerora summit, is at 1,000 meters, and this can attract alpine conditions in that part of NZ, including very occasional snow and cold winds. The tracks are usually fine enough after rain: muddy but nothing too deep. Best bike: a hybrid bike or MTB is recommended, and 40 mm tyres with some kind of knobs is a good minimum for comfort and traction. The tracks are not too rough, but can be a bit bumpy, so it would be best to avoid thin tyres and road bikes. Recumbents should be fine, but trikes (and bikes with panniers) will encounter issues with the anti-trailbike gates and narrower sections of track. Maps and directions: just follow this guide! The trail is signed and has markers at about every kilometer. Most people do this trail by leaving their car with a commercial operator than then will drop them at the beginning of the trail in Pureroa and pick them up again at the end in Ongarue. This can be quite expensive and frankly not really the most environmentally friendly option. Instead of using operators we are suggesting to cycle from the Ongarue end to the trail head in Pureroa. This adds another day to the trip if you are not fit and slow, or about half a day for faster people. Another option for an easy two day trip is to cycle from Ongarue to the Piropiro campsite and only do the second section of the Timber trail. This is our personal favorite as it avoids the big climb to Purerora and the first section of the Timber trail is a bit bland compared to the nicer second part. The best option for leaving your car is inside the small village of Ongarue, where the Memorial Park has toilets and drinking water. It is a good spot to camp before the trip but don’t forget to pack earplugs as the park is only a few meters from the railway and there’s a few freight trains passing there during the night. The official end of the Timber Trail is a bit less than 2 km away from the village, at the intersection of Ngakonui-Ongarue Rd and Bennett Rd. There’s a car park and drop toilets there, and although it’s a bit more remote, it should still be safe to leave your car there too. From Ongarue follow the quiet Ongarue-Waimiha Rd north for 30 km. Then turn right onto SH30 which will be busier but should still not be too bad for cycling. Follow it for 21 km and turn right on Maraeroa Rd for 1.5 km. Take left onto Barryville Rd for 2.25 km to the head of the Timber Trail. This option is the best as it only follows quiet roads with very low traffic. Still, be careful as traffic can appear at any time. From the Ongarue village, cross the railway, take right and head north on the Ongarue-Waimiha Rd for 17 km. After the few houses that make the village of Waimiha take right on the Ongarue Stream Rd. 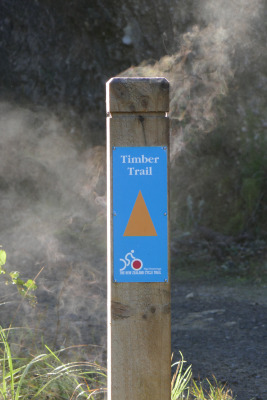 There is a Timber Trail sign at the intersection. Continue for 4.5 km until you reach the fork intersection with Kokomiko Road. The road on the left would take you to the ruins of the Endean’s Mill, once home of the small town of Piropiro, complete with school and shops. Only the mill buildings and a few houses are left now. If you have time, it’s worth the 5 km return detour to look at the place. It wouldn’t be out of place in a horror movie actually! The Ongarue Stream Road continues for 12 more kilometers to the Black Fern Lodge, and from there you can join back the Timber Trail following the signs along Sulkie Rd and some private 4wd tracks for 6 km. This leads to the 35 km marker on the trail. But unless you are staying at the lodge, this long detour is not worth it. Back at the Kokomiko Rd intersection, take right on the gravel road. The Piropiro campsite and Timber Trail are signposted. Follow Kokomiko Rd for 14 km until you reach the Piropiro campsite. The track starts from Pureroa, near the DOC field base. The trail head is signposted on the roadside. On the other side of the road is a large DOC camping area ($8 per person). You begin with a long ascent, 10 km to from 570 meters to 940 meters, just below the summit of the Pureroa mountain. Three and a half kilometers after the start of the trail you have the opportunity to go see an old small bulldozer, a symbol of the past and present fights to try to save the native forest (or what’s left of it) from logging. Five kilometers later you should reach the first of the small red shelters built along the trail to provide some rest in case of rain. This is almost the end of the hardest part of the climb. At the 11 km marker you reach an intersection with a side track for the summit of the Pureroa mountain. It is a further 150 meters climb on feet to get to the top, and it should take a further 1.5 to 2 hours return, but it’s worth it on a clear day, as you will be rewarded with great views. If you are already in thick fog although you might prefer skipping it. A further 3 km on the trail and you reach the highest point and from now on it’s a nice downhill. The next major climb is well after Piropiro and only lasts 30 minutes. You will pass the junction with the track for the Bog Inn hut. This is a 4 bunks standard hut ($5 pp), in a middle of a marshy area, and it’s most frequently used by local hunters. It is a good option for the night, but is 1.5 km off the track. You will then cross above the Bog Inn Creek on a 115 meters long swing bridge, soon followed by the Orauhora bridge. After that the trail follows different 4wd tracks and old forestry roads. Be careful as, sadly, quad bikes, trail bikes and even 4WDs are common on those tracks. This usually makes that part of the trail (up to the Maramataha bridge) quite noisy and unpleasant. 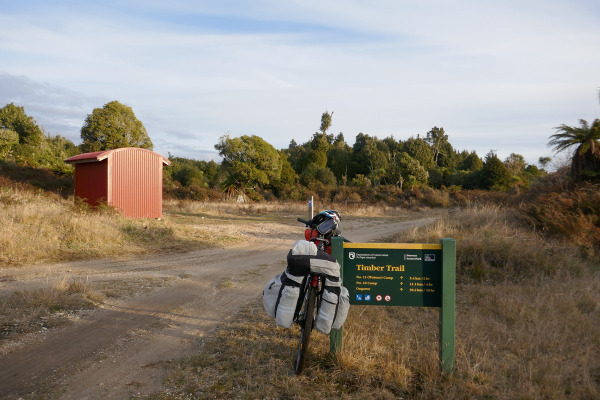 At the 27 km marker, just after a short swing bridge, you reach the Harrisons Creek rest area, with a shelter, toilets, and an area suitable for pitching tents. It’s a nice place to camp, quiet and away from everything. Follow the 4wd track below the bridge to get to the stream to get water. A few more kilometers and the scenery doesn’t improve as the area has been recently logged and it the native vegetation is struggling to survive among the introduced species. On the road you will reach the historic Stump House where two people used to leave after their mate kicked them out of the hut they were using to log the area. At the 35 km marker the intersection with the track to Black Fern Lodge is reached. 200 meters away on this track is a formal campsite with old toilets. Four more kilometers and the 39 km welcomes you with a side track to go to the free Piropiro campsite (and above, its super-expensive, super-ugly purpose-built lodge). We can’t really say that we’ve had a good experience at the Piropiro campsite as we had the “luck” of finding locals there who had invested the shelters, playing loud music, chainsawing trees and circling the campsite with quad bikes during the night, until early hours of the morning. So we would suggest to go stop at another campsite on the trail, where it will be more likely that you can have a restful night. After the campsite you follow a dirt road to the official trail carpark, and after a short while you finally leave forest roads for a true backcountry experience. The road is replaced by a purpose-built cycle track through the native forest. This is one of the best sections of the whole trail. After a while you meet a 4wd track for a very short time until you have to pass the longest swing bridge of the trail across the Maramataha Gorge. Built for a cost of half a million dollar it spans 141 meters. After the bridge you meet the last “big” climb of the trail, which should last for about 30 minutes. After the climb you get to a clearing, with old cart wheels and a sign stating that you are now following the old Ellis & Burnand Timber Tramway. Rejoice as the trail is now mostly an easy downhill ride and the track is great, as you are finally entering the heart of the wild Pureroa Forest on one of the best preserved bush tramways of the country. Just after the 50 km marker you meet the intersection with the Waione tram track. Despite the name this track is rougher than the Timber trail, so unless you are on a MTB you might want to avoid it. It is about 8 km long and adds an hour to your day if you think you won’t have enough riding today. 15 minutes down the track you meet a 4WD track going to the right at the Mystery Creek three-point turn. Ignore that track and keep left for a while until you meet the Mystery Creek campsite (marker 54), with a small shelter, toilets and suitable tent sites but no access to water nearby. After passing Waione Siding you cross a short swing bridge before getting to the No 11 camp (59 km). This is a great place to stay in wet or cold weather as it has a double-walled shelter (small, about 3 persons would fit). There is no toilet here, so bury your waste more than 200 metres from the nearby stream which is also your source of water. There’s not much space for pitching a tent either, but you could pitch one or two small tents on the side of the trail in a pinch. Just across the shelter there’s interesting signs about the Jigger turntable and distractions of local workers. Inside the shelter is an historic school report on the local mills, left by someone who used to live here. Quite an interesting read. Continue and you will reach in a short distance the Skid platform, where logs used to be moved on and out of the carts, the historic No 10 camp, and finally the No 10 campsite with a small red shelter, toilets, tent sites and water from the stream 50 metres further on the track. You might be lucky to even see one of the very big eels that live here. Again, this is a very nice place to pitch a tent. After that the track becomes a bit rough at times. 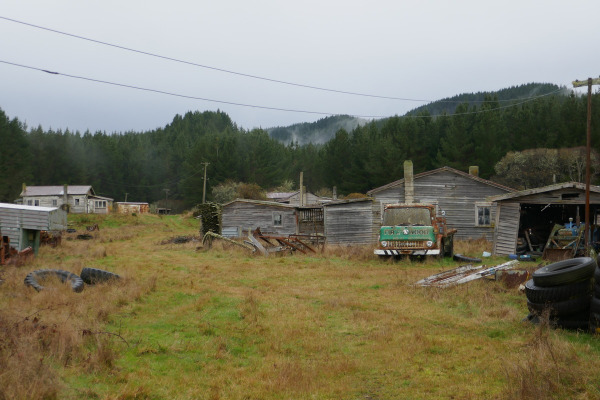 Watch for the historic Waikoura camp. It used to be a small village, with streets and homes, but there’s not much left except parts of the old Waikoura bridge at the bottom of the creek. Lucky for you, there’s a brand new bridge that should be a tad safer! After passing the historic Falls camp you cross the last of the long swing bridges, the Mangatukutuku (around marker 69), 88 meters long. Another shorter bridge is reached a bit later, and then you will get to the Ongarue spiral at km 74. A very interesting engineering feat. You are doing a loop, passing above the trail on a bridge and then going down in a tunnel and under that same bridge, losing dozens of meters of altitude at once. There’s a small red shelter and toilets between the bridge and the tunnel, but no suitable place to pitch a tent. You might also want to have a light in the tunnel, as it is fairly dark, but it is completely doable to go through it without a light is you go slow enough as the ground is a bit uneven. After a glorious section of single track with great views you cross a logging road. The last section of the trail is undulating along the Mangakahu stream, crossing pine forests and pastures until you finally get to the Bennett Rd carpark. If you are parked in Ongarue village just take right at the car park exit, along the Ngakonui-Ongarue Rd. Reviewed in June 2017 (winter) as a 3 day loop ride from Ongarue, on an hybrid bike with 40 mm slick tyres (and it did fine), coldest temperature at night was -2°C.